Jobs Description: DHA Medical Centre Lahore Jobs January 2019 are listed below in our site. DHA Medical Centre, W-Block, Phase-III Lahore is primary health care hospital, it is committed to providing high-quality medical facilities. DHA Lahore offers competitive career opportunities and prospects under the conductive working environment. The organization is looking for talented, qualified & competent individuals. 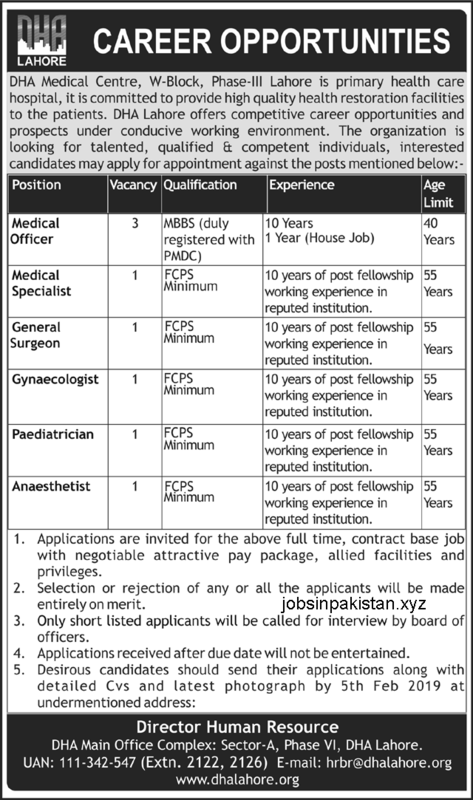 DHA Medical Centre Lahore has required the applications for following jobs. How To Apply: The interested candidates may send their application to DHA Medical Centre Lahore.